July | 2008 | 6log - How does that work then? 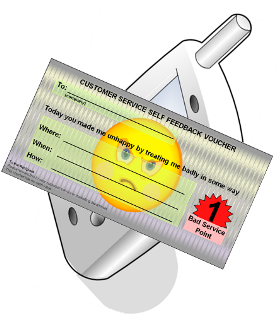 Over the weekend, I was very nearly forced to hand out an “Unhappy Voucher” after a foray into Mobile madness. Not quite in Norse saga territory, but after getting my daughter’s mobile phone replaced three times (cracked keys, random turning-off, etc., etc..), I finally gave in, consigned the not so old phone to Silicon Heaven, bought a new model on some cute subsidised deal, put the SIM in the Box of Many Identities, and handed over the new toy. Me: ….phone broken…..screen blank……Slug……packaging……not necessary…..in the bin. Please could you replace it for me? This entry was posted in Uncategorized and tagged Mobile, Opinion & Humour, People on July 15, 2008 by andy.